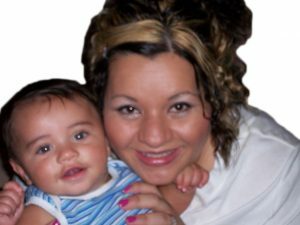 Finally… A Proven Method to Help the Older Woman Overcome Infertility and Go On to Realize Her Dream of Motherhood… Fast! Order now and begin your life of great victory over infertility! The doctor said it could not happen, but God did it! “The doctor said it could not happen. When he found scar tissue, endometriosis, three cysts sitting on my fallopian tubes causing them to bend. The only solution offered to me to have a baby was Invitro. Thank God for the book “Woman You are not infertile” and Who Said You Are Too Old To Conceive? I leaned towards God’s promises and I started calling those things that are not as though they are well. Praise the Lord there is a baby there! Look at the scan and show it to the world. If you’re ready for the whole truth about how to overcome infertility at your age, you must listen up right now. I am about to share a secret weapon with you that will finally demolish any barriers or limitations that have been bogging you down. And I am so eager to get this information into your hands so you can start benefiting from it straight away. Let me introduce you to some of the things you will learn about age and fertility from God’s Word in “Who Said You are Too Old to Conceive?” The Word of God has these promises for you. They shall still bear fruit in old age, they shall be fresh and flourishing, to declare that the Lord is upright; He is my rock, and there is no unrighteousness in Him. Psalm 92:12-15. The Bible says, “If the Spirit of Him who raised Jesus from the dead dwells in you, He who raised Christ from the dead will also give life to your mortal bodies through His Spirit who dwells in you.” Romans 8:11. God says you are like a tree planted by the rivers of water, that brings forth its fruit in its season. Whose leaf also shall not wither. This means your eggs cannot fail. Your reproductive organs cannot become outdated. And whatever you do shall prosper. Psalm 1:3. This is your season to prosper because Gods Word says so. God says He will satisfy your desires with good things so that your youth is renewed like the eagles. Those good things include having your baby at the age in which you are now. These are just some of the promises of God for the older woman concerning childbirth. Age cannot stop you from having children. No matter how old you are. I want you to know that God loves you and cares about you. He sends you His word to bring you victory. 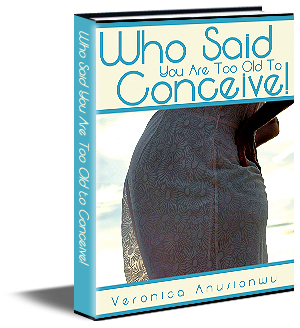 “Who Said You are Too Old to Conceive?” shows you the Truth of God’s Word. You are Never Too Old to Have Your Own Baby! The menopause cannot stop you. Egg production problem is not big enough to stop you if you trust God’s Word. I am not here to argue with medical facts but to point you to a more powerful source and that is the Word of God. In Jesus Christ there is hope for you, and the Bible has many wonderful promises for you. You do not have to accept that your age can stop you from having a child. I am happy to hear recently in the news that the medical profession is now agreeing that the menopause can be revised. If they had read, “Who Said You are Too Old to Conceive?” they would have known this is not NEWS! God already told us so! In this wonderful booklet, you’ll see that God wants you to know that delivering a child is ordained to be easy and without hassles.Brighten your day by relaxing in total comfort and get cosy with the exciting information in this book. It is your time to shine in your pregnancy. Blissful pregnancy and pain-free childbirth is your heritage from the Lord and you’ll learn how to allow for all His blessings in this one-of-a-kind resource. Choosing your baby’s name can be one of the most important decisions any expectant parent can make. It is an exciting time and great things are happening in your life as a new baby is coming into your family. There is joy and excitement everywhere and I rejoice with you. Yet you must decide on a name for this new bundle of joy coming into your life. In this helpful bonus booklet, you’ll learn how to quickly and easily select the perfect Christian or biblical name for your baby. It may not be a Christian or biblical name but you want to make sure the name will be a blessing to your child. This extraordinary bonus booklet will allow you to give your child a name that will have real meaning and be a true blessing in his life. The benefits from these full-length bonus booklets alone is worth their weight in abundant blessing. They are FREE for you when you choose to make one of the most important and positive steps forward in your family’s life today. Still not convinced? Click HERE for more information. This extraordinary 5-part mini course gives you an exclusive look at what you want to know about your fertility and who God wants to see you happy and leading a fulfilled family life. Taken straight from the pages of the new “Who Said You are Too Old to Conceive,” you will be one of the first to see the valuable resources that are available to you when you simply allow for the miraculous power of God into your life in real and meaningful ways! Simply enter you name and e-mail address below to receive this FREE, five-part mini-course. We don’t like spam either, so we promise to never sell or give away your information to anyone.